Panam Sports and Tachihi Holdings Co., Ltd. sign an important collaboration agreement with the Japanese city of Tachikawa and its Chamber of Commerce and Industry for the realization of a Training Camp that will benefit more than 300 athletes from the Americas prior to the Tokyo 2020 Olympic Games. TOKYO (November 26, 2018) – The annual General Assembly of the Association of National Olympic Committees (ANOC) is not the only reason why the President of Panam Sports, Neven Ilic, and Secretary General, Ivar Sisniega, have traveled to Japan this week. During their stay in the “Land of the Rising Sun”, the two sport leaders were invited to the city of Tachikawa to visit its spectacular sports facilities that are located just 35 kilometers from the Japanese capital of Tokyo. 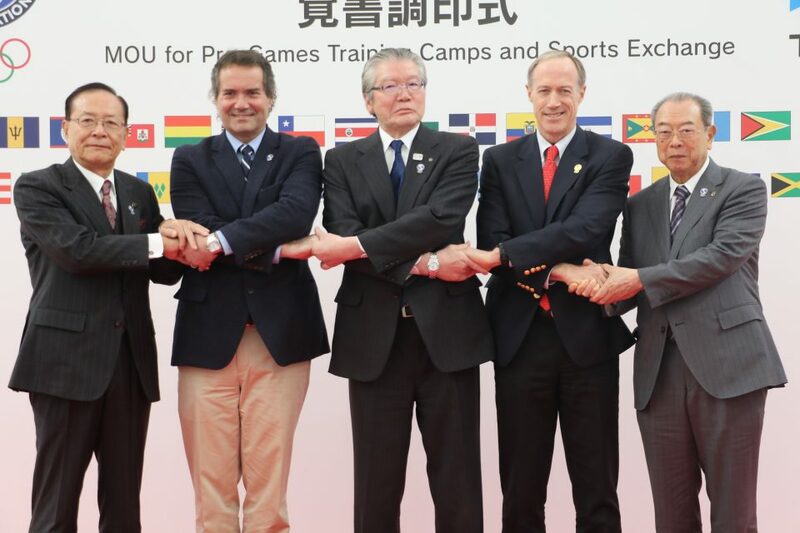 While there, Ilic and Sisniega also signed an important cooperation agreement between Tachihi Holdings Co. and Panam Sports for the realization of a Training Camp prior to the Tokyo 2020 Summer Olympics. The main objective of this camp is to allow more than 300 athletes from the Americas who have qualified to the Olympics to train and prepare in Japan before the Opening Ceremony of the most important multisport event in the world. The top athletes of the Americas will be able to acclimate to the conditions of the Olympic host city as they train and prepare for several days in advance of their Olympic competitions. The athletes will also learn and share experiences with athletes of Japan as well as the citizens of Tachikawa. The signing of the agreement took place in the same sports complex where the camp will be held, with the leaders of Panam Sports, the Mayor of Tachikawa, Shouhei Shimizu, the President of the Tachikawa Chamber of Commerce and Industry, Koji Sato and the President of Tachihi Holdings, Masamichi Murayama. “The truth is that we are, first and foremost, very grateful and honored with the invitation from the President of Tachihi Holdings, Masamichi Murayama. We have been pleasantly surprised with this beautiful city of Tachikawa, with its sports facilities, and above all with the warmth of its people,” said Panam Sports President, Neven Ilic. “The cooperation agreement we have just signed is of great importance to our athletes from the Americas. This will allow many of them to arrive several days before the start of the Olympic Games, to be able to live in this country, to cope well with the time change and the jet lag, and to be able to live a truly unique experience training in these spectacular facilities,” Ilic added. “For the children of Tachikawa, having the Olympic Games in Japan is one of the greatest opportunities they’ve had in decades, and having the possibility of having camps prior to the event, is a great moment for the children to meet the most outstanding Olympians. Tachikawa has a wonderful infrastructure, and we believe that the athletes of the Americas will be able to achieve great success in the Games,” said Tachihi Holdings President, Masamichi Murayama. After the signing ceremony, a group of children performed an artistic show for the more than 100 guests in attendance before bidding farewell to the leaders of sport in the Americas with flags of the 41 member countries of the Pan American Sports Organization. The Panam Sports leaders now turn their attention to the XXIII ANOC General Assembly that begins in Tokyo on November 28. Panam Sports President Neven Ilic will assume the Vice Presidency of the global organization by replacing Julio Maglione of Uruguay. The three new members of the ANOC Executive Council from the Americas who were elected at the Panam Sports General Assembly in Lima, Peru in September – Camilo Perez, Tricia Smith and Keith Joseph – will also be attending their first ANOC Assembly in their new leadership positions.